Bridal Bee's Blog on Flower Girls & Beyond: Amazing Atticus in His White Suit! Ina Kuster, a loving mother, shared with us on Facebook a photo of her son Atticus! "Atticus in his new Nancy August suit.We LOVE this suit on him.and what a strange 2 year old.he loves his fancy clothes!" That's so funny! We love a little boy with a great sense of style! Atticus probably developed his taste for fancy clothes from his stylish mom who has been dressing him for 2 years! He looks so dashing and handsome in his all white suit! We can spot a Christmas tree in the background, this must have made a wonderful holiday photo of Atticus to share with friends and family. Thank you Ina for sharing your photo with us! What the oh-so-stylish Atticus is wearing: Classic Toddler Boys Suit in White, Item Id: SUIT10T-WHT. 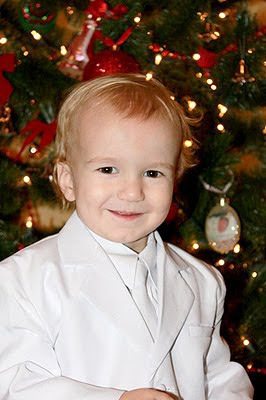 An all white suit makes a great choice for any little boy; it's so versatile! Acceptable for all sorts of special events, the all-white suit perfectly captures timeless elegance. This complete set includes a single breasted, double buttoned jacket with two pockets and a notched collar, a dapper three button vest, a crisp, white button down dress shirt, an adjustable necktie, and trousers with an elastic waistband. For the holidays, the entire set can be worn. For the warmer months, the jacket can be removed, making this an adorable vest suit set! For an affordable price, you can handsomely dress up your little boy in a full suit that will make him look and feel amazing for any special event throughout the year! 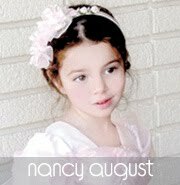 If you would like to be featured on our blog, send us a photo of your little one wearing his or her NancyAugust.com purchase to: Info@NancyAugust.com! Click here to shop for your little guys suit today!